A giant leap for construction! Robert Woodhead’s National Space Centre Ultra Site receives stratospheric praise from Considerate Constructors Scheme. The National Space Centre’s Launch Pad project lifted off to new heights with a dramatic community launch – which took construction to the edges of earth’s atmosphere. The launch provided a spectacle for hundreds of school children, local residents and workers who witnessed a teddy bear, and a construction bolt that will later be used as part of the completed works, ascending into the atmosphere powered by a huge helium balloon. The project carried out by Scheme Partner Robert Woodhead Ltd has achieved Ultra Site status and this launch proves that innovation and technology is at the very heart of their successful engagement with the local community. As part of this celebration of innovation and community engagement, the site produced a special film which includes details about the Ultra Site activities and interviews from the client, site team and Chief Executive of the Scheme, Edward Hardy. You can view the video here along with more details about this project. The Ultra Site was to build a brand new ‘Launch Pad’ ticketing hall, which will extend the Leicester-based National Space Centre and improve the experience for the record numbers of visitors, reaching over 300,000 in 2017. Despite this being the shortest duration Ultra Site to date at only 14 weeks, Robert Woodhead’s Launch Pad project achieved the very highest standards of considerate construction, working in true collaboration with the client and its supply chain. 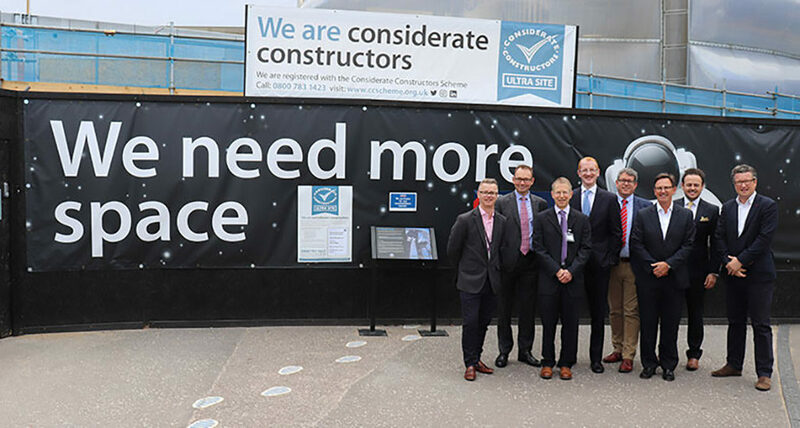 Edward Hardy, Chief Executive of the Considerate Constructors Scheme said: “The National Space Centre Ultra Site is an example of the exceptional standards of performance which can be achieved in a very short period of time when everyone works together. Tony Robinson, Project Manager at Robert Woodhead Ltd said: “The fast track, 14-week project duration really pushed us to innovate and think of new ideas to demonstrate that exceptional levels of consideration can be achieved in tight timescales.